Wednesfield Aces legend, Lee Aris, is bound for a new life in Australia and leaves behind an incredible Cycle Speedway career. Lee started cycle speedway back in 1987 at the age of 8 with Wednesfield and has never looked back since. Back then, there wasn’t much racing for youngsters, so there was not much individual success in his early years. In 1993 Lee did move to Dudley CSC for 1 year and it was here that he won his first British title and became the under 15s British Champion. In 1998, Lee knew he was ready for the big stage. when at the age of 19 he had a run off for the senior title against another legend, Dave Hemsley. But drew the outside grid and had to settle for 2nd place. Lee had wait another 5 years before he became national champion at Horspath, when he had another run off, once again Dave Hemsley and Shaun Woodhouse. Lee went on to win a further 3 titles in 2006, 2007 and his final one in 2009. Lee has also won numerous indoor titles and has been world number 2 at Bury. Lee Aris winning his third British title at Ipswich in 2007. 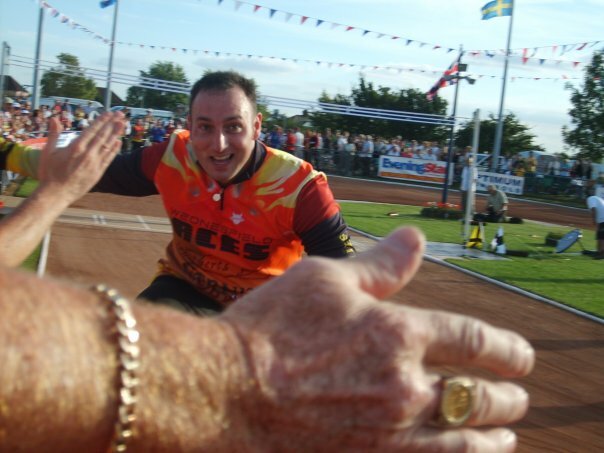 With his beloved Wednesfield, Lee has also won numerous team titles. He has won 7 British Team Cups, 2 Elite League titles and countless Midland League. As much as Lee has had his success in individual events, he is very much a team man. His new venture as GB team manager will be to hopefully win the test match series over in Australia later this year. Wednesfield Aces know that we are losing a top man in their club but wish Lee and his wife, Beth, and his two beautiful girls, Nyla and Erica, all very best of luck in their new life down under. Team Manager, Wayne Aris said: “On a personal note, I have some great people in my life, but these four will leave a massive hole. From all at 33/18 News, Lee, we wish you the best with your new adventure. Cover photo by Linda Kirkland.